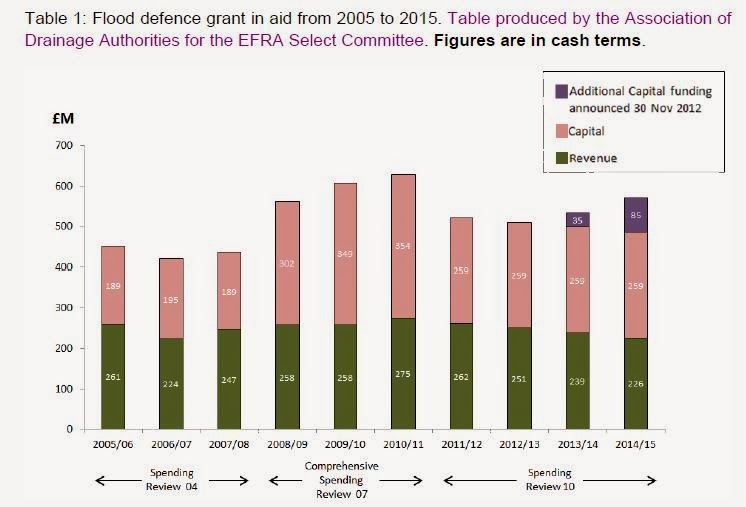 Until 2010, flood defence spending by the government had been steadily increasing: between 1997 and 2010 spending increased by 75% in real terms. There are good reasons why spending should be increasing. One is that climate change is likely to substantially increase the chances of periods of severe rainfall. Flood damage currently costs over £1 billion a year, but the Environment Agency has estimated this figure could rise to £27 billion by 2080. When the current government came to power, their 2010 comprehensive spending review reduced spending by 20% in real terms, according to the Committee on Climate Change. Following floods in 2012 the government provided a small amount of additional money - shown in purple on the chart. So instead of continuing to raise spending to deal with a growing threat, the government cut back spending as part of their austerity programme. It is a distraction to try and link specific episodes of flooding to spending cutbacks. These things work on probabilities. It is also a distraction to obsess about whether spending has gone up or down in real terms. The government will claim that spending on ‘frontline’ defences has not fallen because of ‘efficiency savings’ elsewhere and partnerships with local authorities, but the real point is this. The recession presented the government with a huge opportunity, to bring forward the many existing plans to enhance the UK’s flood defences at a time when labour was cheap and borrowing costs very low. They chose not to take advantage of that opportunity, ostensibly because of a potential debt crisis but in reality because of an ideological distaste for public spending. Over the next decade or two, many people will pay the price for that decision, either directly as their homes and businesses are flooded, or indirectly through higher insurance premiums. I was struck by Stiglitz's recent article DEC 4, 2013 'An Agenda to Save the Euro' that the "euro’s design reflects the neoliberal economic doctrines that prevailed when the single currency was conceived." Given that the Liberal Party and the Blairites were and are still interested in joining the Euro, that does explain how the Liberals ended joining up with the neoliberal Thatcherites in the project from 2010 that if you control inflation everything else in the economy will take care of itself. If you don't see the Euro as an automatic destabiliser, then you end up in temporary alliance even with those in the Tory Party who hate the Euro as they can hate it only for political reasons - you would need to think in terms of sticky prices and wages for the economic argument to be wrong, and these Tories don't do Keynes and Fisher. I know that Enoch Powell was very excited by the Germans in 1957 having a central bank that only focused on inflation, so its not just about Friedman, Phelps, and Lucas. Because of UK politics it seems odd to say that the Liberals, New Labour and the Thatcherites are part of one movement, but intellectually that seems to be the case. "....if you control inflation everything else in the economy will take care of itself." I think this idea is a myth invented in the wake of the financial crisis - find me an example where a policymaker said this. I do recall it being said that price stability was the best contribution monetary policy could make to economic efficiency (which I still believe to be true and so would be happy to join a Germanic euro) but that is not quite the same thing. Lowland UK will prefer to see an emerging statist party with strong conviction in government role for flood protection. Highland UK will be happy with Tories' style status quo which is bitter with the use of public money to fight flooding. The future of UK will be about class struggle between highlanders and lowlanders. What worries me more is the unrealistic sense of entitlement that the politicians have cultivated in the sybaritic British public. People expect to be able to live in picturesque flood-prone villages and have their services restored rapidly after extreme weather events during a public holiday while moaning about utility bills (including environmental charges), and resist development which often forces houses to be built in flood plains because that is the least-intensively used land while adding (fast draining) hardstanding for an increasing number of cars on their own land. As a updated version ( http://www.theguardian.com/uk-news/2013/dec/27/david-cameron-confronted-residents-flooded-village ) of the article that Simon links to explains: "A proposal to build a earthworks burm – a raised mound – around the village was not taken forward following consultation with the local community, partly because of its aesthetic impact on the village". I guess it must be just pure laziness, and my sybaritic nature ("do peel me a grape, Mr Osborne") and that sense of entitlement that is stopping me from getting out my garden spade and building our local flood defences myself. "...the unrealistic sense of entitlement that the politicians have cultivated in the sybaritic British public"
Don't worry, Cameron and his multi-millionaire chums will soon strip everyone of any entitlements (apart from their own, of course). No doubt we need to recover financial lose too and that can be possible only if we have some reputed insuarance companies. We are family and have good relations with many insuarance companies those are proficient in recovery of financial lose. We are provide socially and economically supports to the sick people.Mission Valley Flood Damage is one of our main campaign.